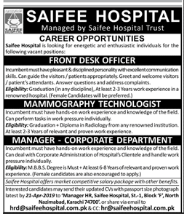 Mammography Technologist Job is available with SAIFEE HOSPITAL in Pakistan, Karachi. It is a Senior Level level role. This applicant should be Degree In Radiologist qualified for this position. This job will expire on 15 May 2019. This job involves skills like Ability to 'read' customers. Ability to use positive language. Time management skills. Acting skills. Knowledge of the Product. Clear communication skills. , Technologist Experience required is 2-3 years. Just like this, we collect thousands of jobs from different channels and make it easy for you to apply. Perfect your CV / Resume from a suitable template especially developed for you - download and update by yourself or get it done from our consultants. How To Reach Your Goals?